Nationals GM Mike Rizzo discussed his team's acquisition of Scott Hairston with reporters (including MASNsports.com's Dan Kolko) today. Hairston was the Nats' top target for right-handed bench help and the club had been negotiating with the Cubs for a couple of weeks, with an eye towards getting the deal finalized before the Nationals' current series with the Phillies. Rizzo liked that Hairston was contracted through 2014 so he can be an asset to Washington next season as well. Rizzo also noted that the Nats could make another move before the trade deadline but it won't be anything major. "You never stop trying to improve your club, but with that said, we feel like we like the club that we have and we're certainly playing better and we'll see where it takes us from here," Rizzo said. "I don't see any type of big splashy moves that are remaining." Dave Cameron of Fangraphs likes the Hairston trade, noting that it's the kind of shrewd low-cost move that can pay dividends if Washington ends up in the postseason. Thomas Boswell of the Washington Post opines that a trade package of Danny Espinosa, Ross Detwiler, Tyler Moore and Lucas Giolito might be enough for the Nationals to obtain David Price from the Rays. While that's not a bad offer, I think the Rays could score a lot more elite talent if they started shopping their ace lefty. Braves catcher Brian McCann finally seems to be fully healthy and has been red-hot over the last two weeks, leading David O'Brien of the Atlanta Journal-Constitution to predict that if McCann keeps it up, he'll score a free agent contact close to Yadier Molina's five-year, $75MM deal with the Cardinals. O'Brien notes that this deal will come from an AL team that will eventually transition McCann to a DH role, which is why I'd argue that McCann's eventual contract will fall at least $10-$15MM short of Molina's deal. McCann's bat doesn't carry a $15MM average annual value if it's not coming from the catcher position, plus Molina brought elite defense and a less-checkered injury history into his new contract. Zack Wheeler is set to face the Giants on Wednesday, almost two years after he was dealt from San Francisco to the Mets in exchange for Carlos Beltran. ESPN New York's Adam Rubin talks to Wheeler and Giants manager Bruce Bochy about the trade, and Bochy has no regrets since his club was gunning for another World Series title. The Rangers would love to acquire Cliff Lee from the Phillies, CBS Sports' Danny Knobler writes, "but at this point the Phillies seem to have most people in baseball convinced that they won't trade Lee (or maybe anyone else)." In NL East news from earlier today on MLBTR, we shared some Marlins-related news and also some Mets items as part of a collection of New York Notes. The Nationals have acquired outfielder Scott Hairston in a trade with the Cubs, FOX Sports' Ken Rosenthal writes. The Cubs received minor league righty Ivan Pineyro in return, tweets Jon Heyman of CBS Sports. Both teams will also receive a player to be named later, but Cubs GM Jed Hoyer told reporters today that component will "not affect the balance of the deal." Signed by the Cubs to a two-year, $5MM deal in February, the Cubs will chip in less than $500K toward Hairston's $2.5MM salary for 2014, tweets Heyman. Hairston, 33, has played sparingly this year, hitting .172/.232/.434 in 112 plate appearances, the overwhelming majority of them against lefties. As Amanda Comak of the Washington Times notes, the Nats are about to begin a series against the Phillies in which they'll face three straight lefty starters: John Lannan, Cole Hamels, and Cliff Lee. That means Hairston could get a fair amoung of playing time right away, but generally, the Nationals will likely use him primarily off the bench, just as the Cubs did. Hairston's opportunities will probably come at the expense of fellow righty Tyler Moore, who has hit .151/.195/.283 this season. 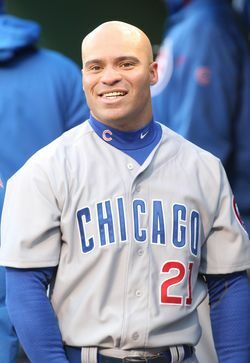 Hairston has a .244/.299/.447 line over ten seasons with the Diamondbacks, Padres, Athletics, Mets and Cubs. He was drafted by the D'Backs in the third round in 2001, at which point current Nationals GM Mike Rizzo was their director of scouting. Even after acquiring Hairston, the Nationals are looking for a second right-handed hitter to add more depth off the bench, notes MLB.com's Bill Ladson. Pineyro, 21, was promoted to High-A in mid-June after making the South Atlantic League All-Star team. In 15 starts overall this year, he has a 3.24 ERA, 8.3 K/9, 2.5 BB/9, and 0.58 HR/9 in 77 2/3 innings. Prior to the season, Baseball America ranked Pineyro 27th among Nationals prospects, noting that the Dominican held his own against older competition, and "his quick arm is intriguing." According to BA, Pineyro throws 90-94 with an average to plus changeup and a curveball that needs work. "If he continues to pitch the way he has been, I think he will be a big league pitcher," Hagerstown Suns pitching coach Franklin Bravo told Ashley Marshall of MLB.com in late April. The Cubs have announced outfielder Tony Campana has been designated for assignment. The move was made to clear a spot on the 40-man roster for Scott Hairston, whose two-year contract was made official in a team press release. Campana's main asset is his speed as he led the Cubs in stolen bases last year with 30, the ninth best total in the National League. The 26-year-old finished 2012 with a slash line of .264/.308/.299 in 192 plate appearances. Campana became expendable after the Cubs bolstered their outfield this winter, according to MLBTR's Transaction Tracker, with the free agent signings of Hairston and Nate Schierholtz. "It was a difficult call for us," Cubs President Theo Epstein was quoted as saying by Paul Sullivan of the Chicago Tribune. "I think it speaks to the fact that our 40-man roster is starting to have better depth on it. We preferred not to take a pitcher off at this juncture. So, looking at the position player group, it seemed to make sense to us to make this procedural move with Tony." Epstein said he would like to keep Campana in the organization, but added he could be a weapon for a contending team in a certain role. The Cubs have 10 days to trade Campana or place him on waivers. JANUARY 29th: The deal guarantees Hairston $5MM over two years and includes an additional $1MM in incentives, Jon Heyman of CBSSports.com reports (on Twitter). JANUARY 23rd: The Cubs have reached an agreement with outfielder Scott Hairston for a two-year deal pending a physical, reports FOXSports.com's Ken Rosenthal (via Twitter). The Excel Sports Management client could receive up to $6MM over the course of the two years including incentives, according to Bruce Levine of ESPNChicago.com (via Twitter). Hairston, 32, enjoyed a career year in 2012 with the Mets as he posted a .263/.299/.504 batting line while playing each of the outfield positions. The veteran's ability to hit left-handed pitching made Hairston a top commodity this offseason given his .867 OPS against southpaws this season. Adding Hairston to the Cubs' outfield mix should lessen some of the offensive burden for left-handed hitters like David DeJesus and Nate Schierholtz, both of whom struggle against left-handed pitchers. Schierholtz and Hairston project to serve as what could be an effective platoon in right field given Schierholtz's success against right-handed pitchers (.811 OPS over the past two seasons). Yesterday, the Yankees avoided arbitration with David Robertson on a one-year, $3.1MM deal, meaning that they have now come to terms with all five of their arb eligible players. All things considered, it has been an unusually quiet offseason for the Bombers as they look to tighten their belt for 2014. Were they close to making other moves along the way? Here's more on that and other news on the Yankees..
Cashman told reporters, including MLB.com's Mark Newman, that he had conversations with the Diamondbacks about Justin Upton but Arizona was never focusing on making a deal with them. That fits in line with a report from ESPN.com's Buster Olney earlier this month that indicated that several teams were anxious to get in on the talks but were struggling to get a response from GM Kevin Towers & Co.
Cashman also said that he's aware that he needs to strengthen the bench and find a right-handed bat for the outfield. However, he doesn't feel as though it all has to come together by Opening Day and suggested that he could explore mid-season deals to make that happen. Meanwhile, the GM says the Yankees were never close to signing Scott Hairston either, despite being linked to him for a good portion of the winter, writes Dan Martin of the New York Post. Cashman added that the club isn't opposed to multi-year deals but did say that they'll have to be careful about it. Hairston agreed to a two-year deal with the Cubs earlier this week. General Manager Brian Cashman told ESPN 98.7's Michael Kay there is a chance that Alex Rodriguez will miss the entire season after undergoing hip surgery, writes Andrew Marchand of ESPNNewYork.com. "It is a very complicated surgery. Any time someone has a surgery, there is always a chance there are complications. That didn't take place in this case. But is it possible? Sure, it is possible, but is it likely? I don't think so," Cashman said. If Rodriguez does have to retire at some point due to his hip issue, the Yankees are insured for most of his contract. A person with knowledge of the Mets’ plans wouldn’t rule out the possibility that the team could sign free agent center fielder Michael Bourn, Adam Rubin of ESPNNewYork.com reports. This would be a surprise, especially since signing the Scott Boras client would lead to the forfeiture of the Mets’ top draft pick this year, the 11th overall selection. GM Sandy Alderson told Andy McCullough of the Star Ledger earlier this month that he had strong reservations about surrendering that selection. David O’Brien of the Atlanta Journal-Constitution hears that Scott Hairston probably isn’t an option for the Braves anymore (Twitter link). By the way, MLBTR extends a hello to Jerry Hairston Sr., who gets information about his son's free agency from this website (via McCullough on Twitter). Hairston Sr. played at the MLB level for 14 seasons, but he pre-dates MLBTR. There are still lots of Hairston rumors thanks to Scott and Jerry Jr. Recent trades have improved depth throughout the Marlins' organization, vice president of player development Marty Scott told Joe Frisaro of MLB.com. "It continues to give us more depth," Scott said. "We do not have a need to rush everybody." The Mets watched free agent reliever Brian Wilson this weekend, and weren’t impressed, Puma reports. The Mets don’t consider the rehabbing right-hander to be worthy of a big league deal at this point. Wilson, who’s recovering from Tommy John surgery, wasn’t interested in a minor league contract, according to Puma. The Mets could watch him pitch later on, but right now he’s not physically ready in the view of Mets personnel. “He’s got a ways to go,” one person said. The Mets were known to have interest in Wilson. It’s believed that the Mets countered Scott Hairston’s asking price of two years and $8MM with a one-year, $2MM offer, Puma reports. One source suggested to the Post that the Mets will find a way of adding an outfielder even if they don’t re-sign the free agent Hairston.